Thor thought he would give everyone a big hi from his big head. He has doubled in size since we got him last November. Three legs doesn't slow him down a bit. He spends as much time as possible trying to catch rabbits, squirrels and chipmunks. So far he has only caught one small baby bunny, which amazingly enough he brought to me. I saw the gray body hanging from his mouth and expected to retrieve a dead animal. To my surprise, the small rabbit was hardly wet and not a mark on it. So Thor may be renamed the gentle giant. my truck into 4-wheel drive to navigate over the mess. Today it has dried up a bit and is much safer. Next weekend is the road rally. If the State does not fix the end of the road near 414 there will be lots of screaming. I have called and complained about the size of the holes and so far have not seen any attempt to repair it. You have to go less than two miles per hour over much of the last 2 miles or risk ruining your car or truck. 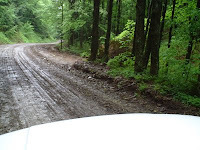 Our township does a stellar job with the rest of the road and it is very disappointing to run from a nice dirt road into moguls. 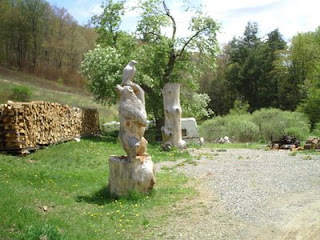 I have been very busy working this month and it seems I haven't been able to post much in the way of news to the blog. I may just have to start including some of the work I do, since that is where all my time is being spent. Thank goodness I can enjoy the woods even if it is only to drive back and forth to work. Mountain girl, Paula, logging off and working hard. 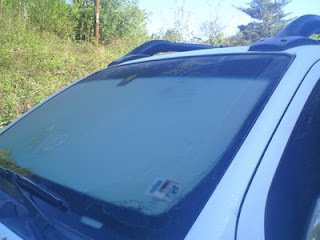 This morning we woke to a heavy frost on the truck and some cold temperatures. It is supposed to get into the upper 20's again tonight so a fire in the fireplace will be happening again tonight. During last nights fire we had some entertainment. A bat swooped through the room and awoke three dogs. I opened the back door and Scooter and Thor tried to catch the bat every time it flew over. I was armed with a broom and a hat. I have had success catching them in my hat before. After a half dozen attempts the bat decided to go up stairs. I looked for a long time and found the bat hanging near a picture. I nabbed it in the hat, but the thing squeezed out. The bat then returned downstairs for another round with the dogs and my broom. I smacked it to the floor and it slid under the stove. I looked everywhere with a flashlight and moved the stove, but the bat disappeared again and I didn't find it. So I sleep with the bedroom door closed and expect to see the bat again tonight. 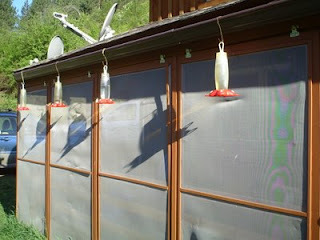 Lee has all her hummingbird feeders up and despite the cold the numbers of birds are increasing daily. 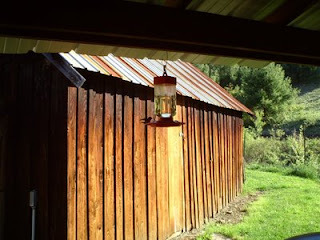 She has a total of 14 feeders up and the cabin is starting to feel like a hummingbird hive once again. Well, we are stoking up the fireplace again tonight and hopefully will not have the winged visitor. Mountain girl, Paula, logging out. 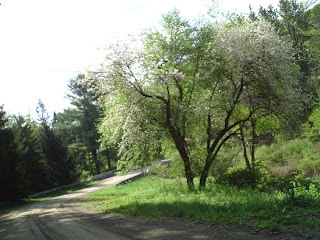 The apple trees are blooming and it is a beautiful day in Leetonia. The wind is gusting up to 3o so it is a bit windy. You can see how the trees are starting to green up and it won't be long until the forest is shady once again. It always seems so much darker in the summer. The advantage of the dark is it is always 10 degrees cooler in the summer as well. 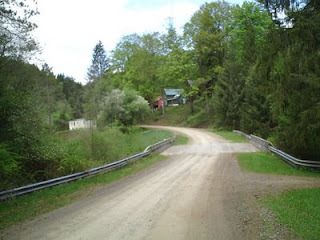 The last picture shows the road coming into Leetonia from the south. There was quite a few people up for Gobbler season this week, but I noticed them all heading home by noon. Hopefully, to spend some time with their mothers. Mountain girl, Paula, logging out. This morning at 1:30 am I was awoken by barking dogs. I yelled at them to be quiet and when they continued I knew something was probably outside. I looked out the back door first and saw and heard nothing. I was just about to give the dogs a false alarm scolding when I turned on the light to the front porch. 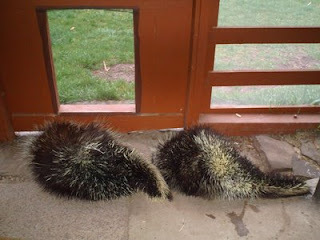 Two porcupines had come through the dog door and now couldn't get out. I own a gun for a couple reasons and this was one of them. I don't enjoy shooting porcupines, but they destroy everything I own. So they are now resting in front of the door getting ready for a trip far away from the dogs. 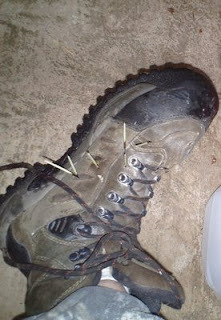 Cleaning up after them is hazardous as you can see by my boot you are just as likely to get quilled moving them. Also they leave quills everywhere if they are disturbed. These quills can get stuck in a dog foot or in your finger as you pick them up. So I have hundreds of small quills to pick up off my porch. Leo hides when I shoot the porcupines, Scooter doesn't care and thankfully it didn't seem to bother Thor who after being shot himself, I worried might be gun shy. 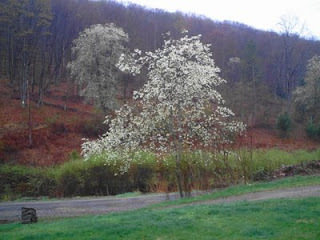 I am going to leave you with a more pleasant picture of the Fire Cherry blooming on the side of the mountain. Our recent rain is greening things up and bringing some color to Leetonia. Mountain girl Paula, Logging off and picking up quills.